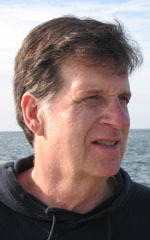 Dr. Asbury (Abby) Sallenger Jr. received his Ph.D. in marine science at the Virginia Institute of Marine Science in 1975, formalizing his life-long interest in beaches and the coastal hazards that threaten them. Currently serving as a research oceanographer for the U.S. Geological Survey’s Center for Coastal and Watershed Studies in St. Petersburg, Florida, Sallenger has become a world-renowned scientist and expert on coastal hazards. Since graduating from VIMS more than 35 years ago, Sallenger has carved a career out of studying the impacts of extreme storms on coastlines and surveying beaches that have been damaged by coastal erosion and sea-level rise. Sallenger has served as the voice of the USGS on hurricanes and coastal change since the mid-1990’s. Sallenger recently served as project lead for a USGS research group exploring the regional variability of sea level rise. Their report—published this past June in Nature Climate Change— is titled “Hotspot of accelerated sea-level rise on the Atlantic coast of North America”. It reveals that rates of sea level rise are increasing 3-to-4 times faster than the global average in a “hotspot” stretching from Cape Hatteras, N.C. to Cape Cod. A pioneer in protecting coastal communities from the hazards of coastal change, Sallenger says his biggest accomplishment has been developing the program on coastal and marine geology for the USGS.